This review contains spoilers, you have been warned! 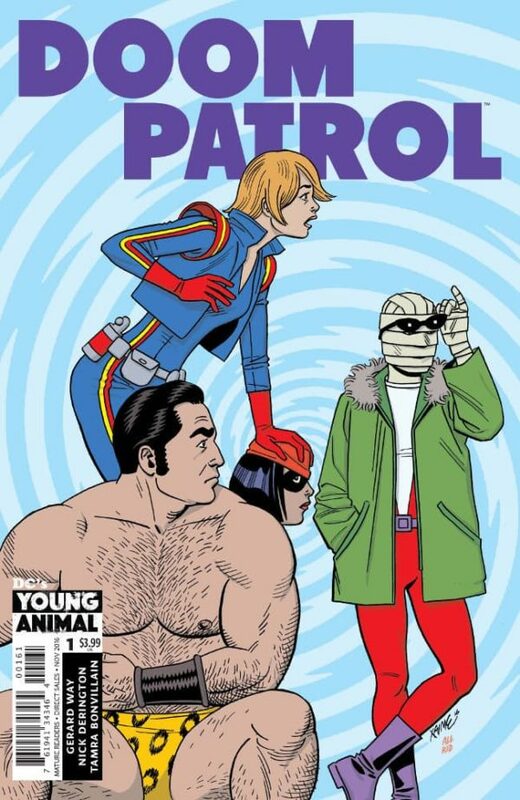 DC has launched their new Young Animal line of comics with the debut of a new Doom Patrol series, from Gerard Way and Nick Derington. The Young Animal brand is also being overseen by Gerard Way, who’s jumped back into comics after his success The Umbrella Academy stints. 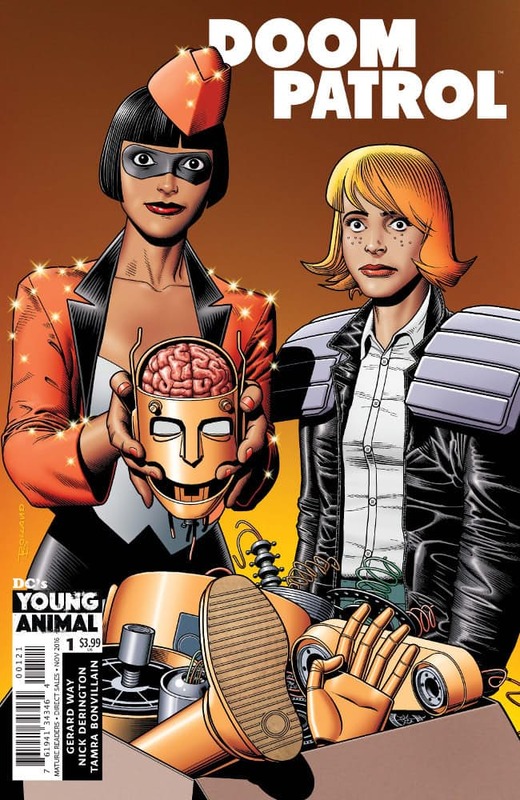 But let’s talk about Doom Patrol, the DC Comics misfits superhero group with a reputation for being a bit odd. Under the watchful eye of Grant Morrison they helped cement the Vertigo brand and now DC is hoping the same series will cement the Young Animal brand. 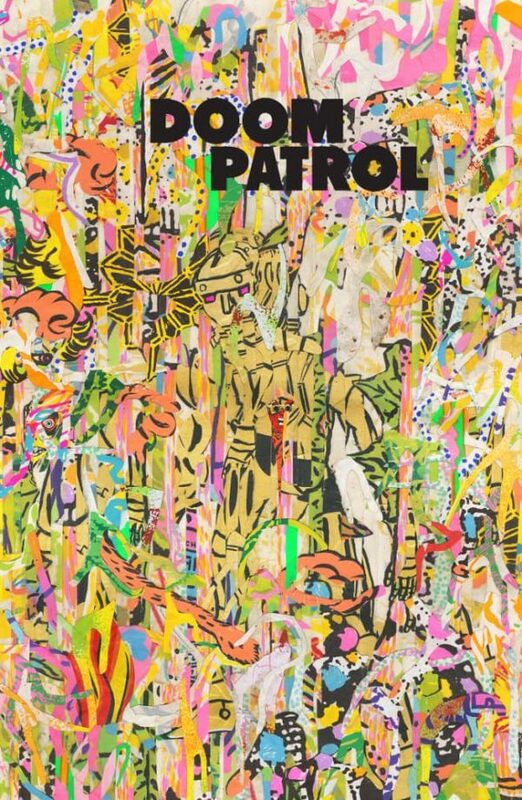 It feels like they’re trying to harken back to the days of Morrison and Vertigo because Way has fully embraced the weirdness that is Doom Patrol. 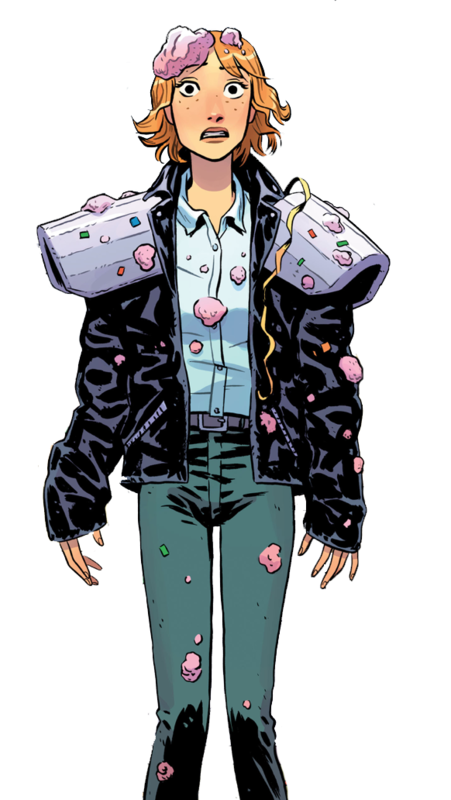 The opening spread introduces us to EMT Casey Brinke, presumably this rendition of the Doom Patrol’s lead character. She’s a bit strange, but in a good way, she’s determined and always has a bright outlook on life. She’s a likable protagonist through which to view the weird world Way is building. She may, or may not, have powers, that has yet to be determined, but she’s got the skills to get a team through thick and thin. Her EMT partner is Samson, who proclaims that his son is a bit strange like her, and they should meet. You have a feeling this could go somewhere, but that’s left for future episodes. Samson has a strange conversation about gyro’s (the meal) that takes it up a notch into the weirdness factor when there seems to be an entire civilization living within the gyro. In some strange twist, Robotman seems to be a part of this gyro civilization, but he manages to escape into Casey’s reality. The few pages it lasted were strange to say the least. 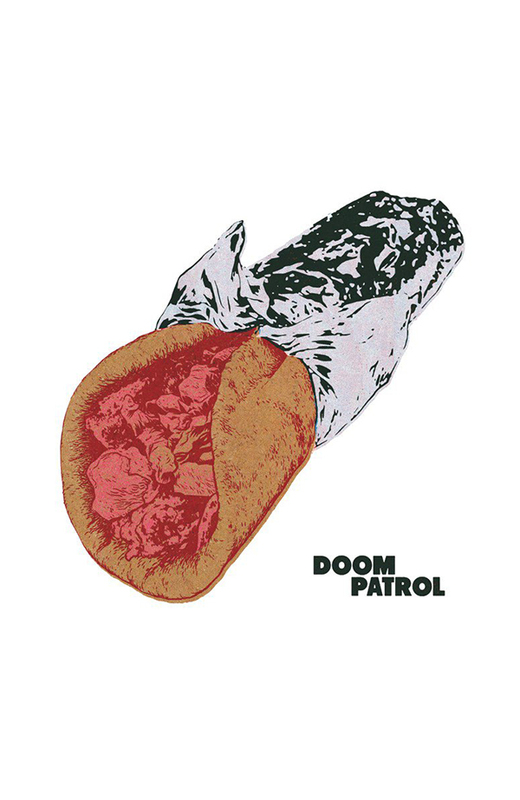 If you’ve never read a Doom Patrol book before, prepare to be confused. Way introduces re-introduces readers to classic Doom Patrol characters like Cliff Steele, the aforementioned Robotman and Niles Caulder. The manner in which they’re introduced will leave new readers wondering just what is going on. Why is someone playing a keyboard? Who is the homeless guy talking to? As was already mentioned, it came across as extremely confusing if you’re not familiar with the characters. It’s felt like this was written for fans of previous Doom Patrol series with a disregard for new readers. Then we’re introduced to aliens, who happen to be meeting at some random chain hotel conference room. To say that their entire conversation about galactic fast food chains was confusing would be an understatement. What relevance it will have going forward, well that’s tough to tell. Surely it will be addressed in future issues, and for all we know they could have set up the antagonists of the series, but it made little sense in how it was presented. The premier ends back at Casey’s apartment, having a discussion with her housemate about rent and why she has a box full of robot parts. They’re interrupted by a knock at the door from Terry None, who may or may not be related to Number None from previous Doom Patrol series. Terry saw Casey on the subway and thought she needed some cheering up. Unfortunately Terry exploded Casey’s roommate, into what looks like cake and confetti. Terry invites herself in and declares that she’s also going to move in to replace Casey’s old roommate. We end with a dead character that was apparently killed by one of the previously introduced characters. Strange, to say the least. It would be remiss if we didn’t talk about Derington’s artwork. Arguably the best thing about this first issue, his pencils exceleld throughout the book, from the emotions the characters expressed to the alien landscapes, everything just worked so well. He didn’t have any heavy or convoluted lines, everything just flowed. It was a simple pencil look, yet he managed to capture so much of what was going on. It was easily the best thing about the book. Way’s writing was very Morrison-eque in that it took the weird and ratcheted it up a notch. The poor introduction of characters, the alien meeting that felt totally out of place. It felt as if he was trying to be as weird as he could, for the sake of being weird. It didn’t work well and that was sorely disappointing. The character introductions could have gone a lot better. it also has to be asked as to where this series is supposed to fit in the grand scheme of things. Is the Young Animal line of books supposed to take place in its own universe, or are these characters in the same universe as the one we’re seeing in DC’s Rebirth titles? 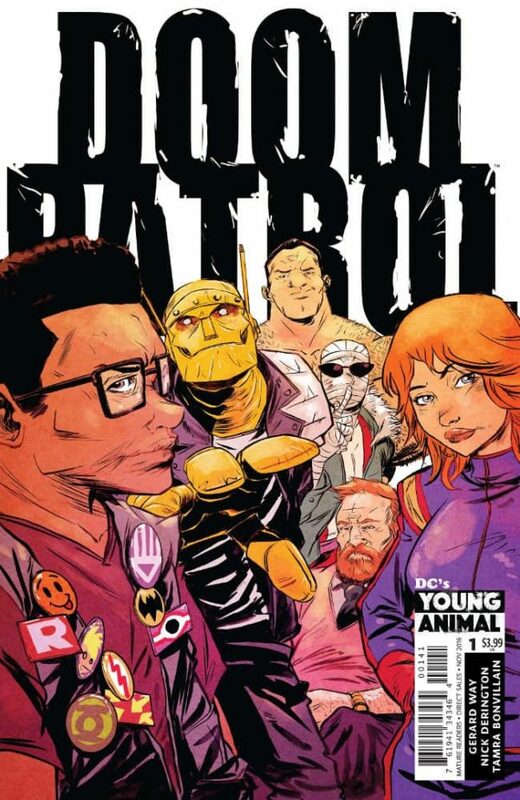 Is this a complete revamp of the Doom Patrol? It felt like a new take on the Doom Patrol, but something that would have premiered in the New 52. 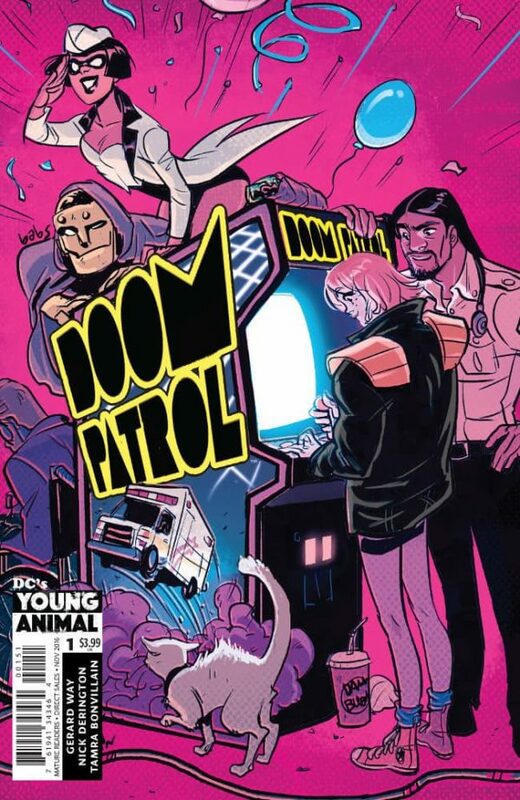 Overall, this is a strange introduction to the Doom Patrol, but if you’re a fan of Morrison’s previous work on the title then you will most certainly enjoy this take. Derington’s artwork was fantastic, but Way’s story fell a bit flat for me. Perhaps another issue or two could iron out any issues I may have with the title, but if that doesn’t change anything then I’m not sure how long it could last.